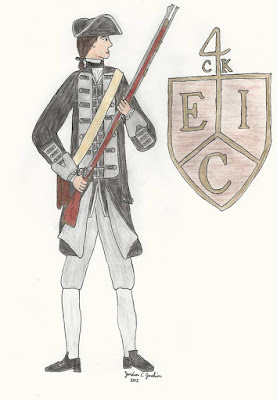 This is a drawing I recently completed of a private soldier of the East India Company's guards from the movie Beyond the Mask. There are at least two types of the Company's soldiers in this movie: one in red coats with blue cuffs and lapels with white lace, and one with black and grey. These men in black coats with grey cuffs and lapels are Charles Kemp's elite guards, unlike the men in red coats and blue cuffs. The men with grey cuffs were probably chosen based on their excellent service in India. These men were trusted with keeping Charles Kemp safe and guarding his property and living quarters. In the movie, they can be seen driving the Company's carriage, accompanying Mr. Kemp to church, and working at Kemp's property in the New World. Charles Kemp was their colonel, and their cuffs were grey, so if they had a nickname, it would probably be "Kemp's Greys."